Quick question: I've rearranged my pedalboard today. Sounds good, except that clean volume gradually drains away. This is remedied by unplugging everything, waiting a minute, plugging everything back in, waiting a minute, then starting playing again. Issue isn't with the amp (I've gone straight to amp to make sure). 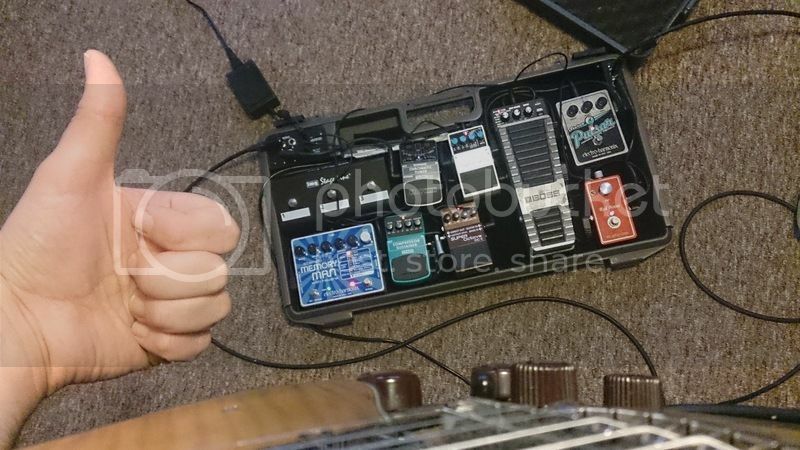 I have a few power hungry pedals on there, (Boss OC-3, EHX Memory Man w/Hazarai, Boss DD-3, Boss PW-10 v-Wah along with fuzz/drive pedals), could it be that there isn't enough power getting to the board? I'm currently using two different supplies at the same time, one daisychained Boss PSU and one daisy chained Johnnyshredfreak brick thingy. You may need one of those big brick power supplies. Do you run a lot of pedals? Honestly I hate using amps and pedals man. I wish every club had an axe fx with foot controller on hand, programmed with easily tweak able patches for every genre. 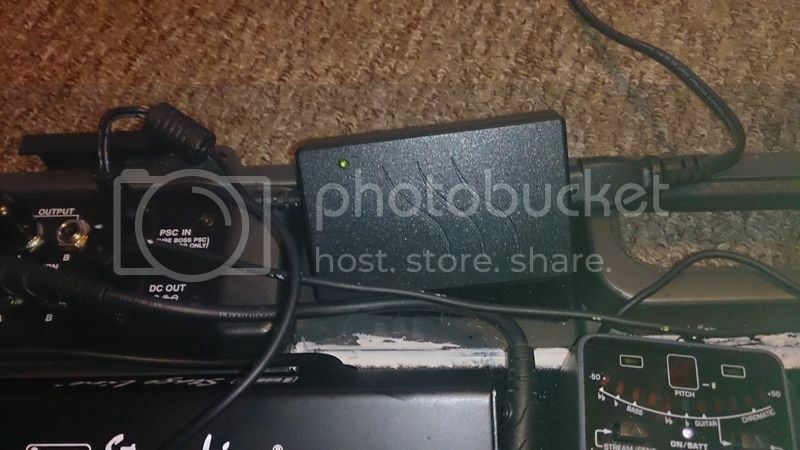 I've powered up to 10 pedals with my JSF power supply in the past with no issue, so unless your one is broken I wouldn't have thought that was the problem. Hmmm, I understand the memory man is a bit power hungry, so I might put that on the Boss PCU by itself and then have everything else run off the JSF. Ultimately, I have loads of generic PSUs lying around so I should be able to sort of saturate the thing in power and see if it still happens. Have you checked the current draw of the pedals against what the PSUs can provide? I've got two different Boss ones. One is 200mA and the other is 500mA. 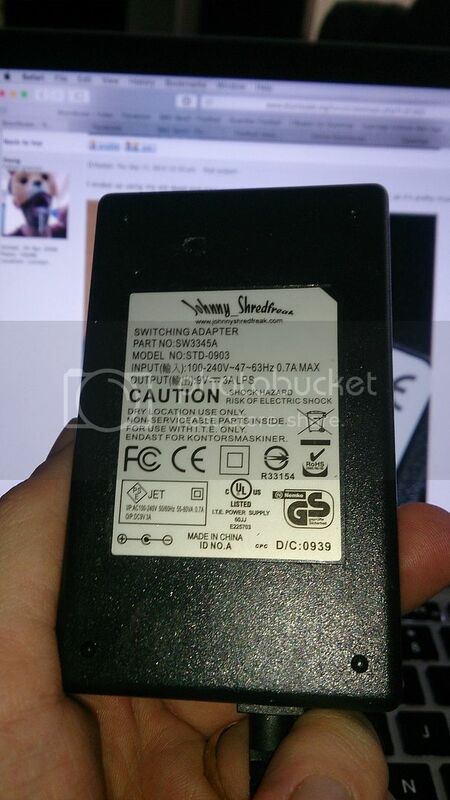 The EHX manual just says "The SMMH requires 9 - 9.6VDC at 200mA with a center negative plug. " Not sure if its current draw is actually the full 200mA. I think some pedals just object to be daisychained with certain others though so it might be a case of trial and error to pin it down. Apparently the EHX Pulsar asks for at least 100mA, who'd have thunk it? Hmm, jiggery pokery and making sure that neither daisy chain adds up to more than is being provided is the solution, I suppose. And the Boss PSU I've been using only gives 200mA. I've found a cheapo Stagg one that an online retailer sent me for free by mistake and it gives 1.0A, so I think that'll be a winner. Okay doog, you win, well done, now everyone knows that you have a higher amperage power supply than I do. 2A seem higher than anything else I can see, other than the 3A Diago one for �59 (which is the same as the JSF one, yes?). I don't know if the current Diago one is the same as the JSF one, but at one point they were, with a �40 markup. LOL. Here's what I've realised about power supplies: It's never a waste of money to buy a really, really good one. Nor a waste of time to actually sit down and work out how much you need, and all the other details. I'm looking at a T Rex Chameleon as my next major pedal purchase. 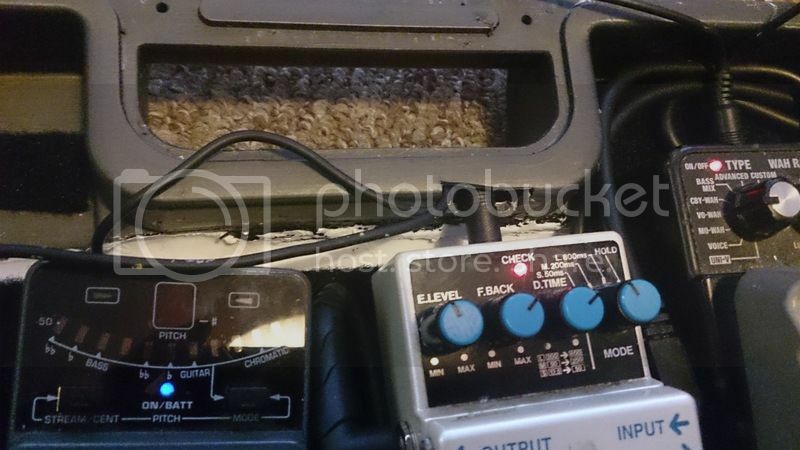 �130 makes it more expensive than most of the pedals it'll be supplying, but it's gonna do everything it needs to do and more. My Diago power supply broke after 6 months to a year of use, went back to be fixed, came back without actually being fixed properly. I bought 2 JSF power supplies to replace and both are still going strong after 5 or so years. Unfortunately they don't sell the JSF ones anymore though. lolz, humblebrag. Just thought I'd give you OPTIONS, y'know. I've got one of those as well, and a Diego. Totalling about 550mA. So everything should run quite comfortably off the JSF. Shall plumb it all up and report back. Have plumbed, and it all works. I'm guessing that previously, when I was using two supplies, the 200mA Boss one must have been overcome by whatever was on that it's daisy chain. I think I had the Pulsar on it because I would never have guessed that what is essentially a clever volume knob would use twice as much power as an OC3. Got rid of the Fuzz factory because there wasn't space on the board. Added a compressor to help provide volume and bigness to the octave down sound as needed. a looper AND a delay? you hipster! Yeah, that might be a bit superfluous. I use the EHX more as a delay than a looper, and I'm experimenting now with two delays because I'm a massive Dave Navarro fanboi. Something else may well end up in that space, though. I'm trying to restrict myself to things that I don't use often or that I'm not particularly effective with. Previously my boards would have been filled with drive and fuzz boxes, but now I have an amp with all the drive sounds I'll need. i've got a board about the size of yours, and yeah... i'm starting to see the virtue in the smaller pedals. i love my peterson tuner, but it's a space hog.